R6 is the Shunt thru which the current to be measured passes. F1 fuse is to protect shunt. D1-D4 ensures that the current flow is not broken if the shunt blows. The Ammeter is always used in series in a circuit. OP07 is used here as a digitally controlled amplifier as the voltage offset error is around 75uV. 4052's digital controls A-B set the range by selecting R1, R2, R3, R5 for the digital code at A-B. The inverting amplifier changes the gain and four current ranges are got. The output of this circuit has to go to a buffer and cannot be loaded directly. R8 is offset trim at very high gains, it has to be adjusted for a zero output of opamp for zero current measured. Rf and Ri are 0.1% MFR, if costly, use bourns 10T trimpot or a difficult way - use series parallel combination and scratch 10% part of resistor network to increase value. LF356 opamp FET input is in a inverting amplifier configuration here. R4 + R5 make up Ri each 1/4 W MFR withstands 250V so both will take upto 500V. Use more in series for higher voltage withstand with care in PCB layout and cabinet insulation. Rf is selected by a digital value at A-B inputs of 4052, that way R1, R2, R3, R6 are selected for four ranges giving various attenuation levels. The important thing in this circuit is the on resistance of 4052 of 100 ohms comes in series with the output resistance of opamp, so the output is taken before the cmos switch . The output of this digital attenuator should not be loaded and should be buffered before use. Rf and Ri are 0.1% MFR, if costly, use bourns 10T trimpot or a difficult way use series parallel combination and scratch 10% part of a network R to increase value. This circuit uses a PNP Power Transistor TIP2955, you can use any other according to your current and voltage requirement. Look at R2 a 10 Ohm resistor, when the current in your load to the power supply is less than 70mA the voltage across R2 is less than 10E * 70mA = 700mV right. The base emitter junction of Q1 will be biased or turned on around 700mV, less than 700mV the transistor just does nothing. When the current in your load goes over 70mA the voltage across R2 goes above 700mV and a small base current Ib flows from emitter to base of Q1 turning on the transistor. Now a collector current Ic flows from emitter to collector and then to your load supplying the excess demand. The Ic = Ib * hfe where hfe or beta is the DC gain value. 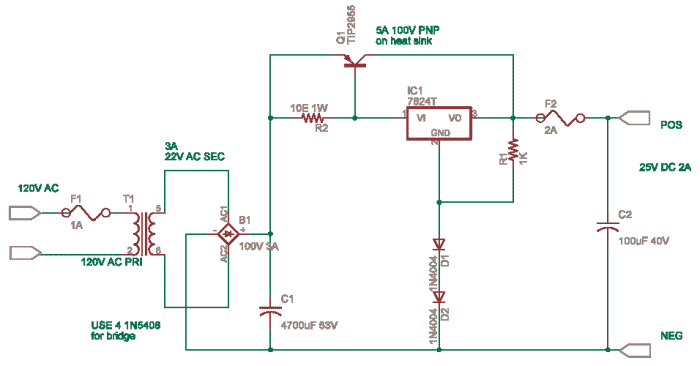 Some transistors will have only AC gain specified which is lower than DC gain. TIP2955 has a gain of 20 so for an Ib of 50mA the Ic will be 1 Amp which saves the regulator from heating up or shutting down as the main current flows thru the transistor. Q1 should be provided with a good heatsink.